In the first chapter of The Newspaper Boy, Chervis Isom, age about 26, makes a visit to an office on the fourteenth floor of the Empire Building in Birmingham. Possibly he remembered learning as a child that it was one of four tall buildings erected between 1902 and 1912 anchoring the intersection of 20th Street and 1st Avenue North. Though not so tall by later standards, these buildings were skyscrapers of the time and the intersection became known as the “Heaviest Corner on Earth.” The buildings represented Birmingham’s sudden emergence as center of industry and commerce and portended a bright future for the city. And, except for the years when the whole country experienced the Great Depression, that’s about the way things turned out. In 1943, which was the year of Isom’s first memoir essay, the wartime demand for steel had returned the city to prosperity, which continued through the postwar building boom. And even as late as the mid 1950s, Birmingham competed with Atlanta, Memphis and New Orleans as one of the premier cities of the south. Now back to Isom’s visit to the Empire building. The year was 1965, and he was a first year law student who had come there to ask Abe Berkowitz, a prominent attorney and civil rights advocate, for a summer job. In the space of less than ten years, the era of Birmingham’s ascension had become a fading memory, and whether the city could even hold on to its second tier status was questionable. This gloomy assessment would have been confirmed by Isom’s view from the fourteenth floor. The Birmingham skyline, where once stood the tallest buildings in the South, didn’t even have the tallest building in Alabama. That distinction had just passed to Mobile. There were a number of reasons given for the City’s precipitous downward spiral—failure to diversify its economic base during the decline of the mining and manufacturing sector, white flight to the suburbs, delays in construction of interstate highways, etc., but what really took Birmingham down was the idea that segregation and white supremacy was justified on moral grounds, and that it would continue forever in spite of federal laws, court orders, and occasionally enforcement action by the military. Meanwhile, in other parts of the South, especially in major cities, there was a growing realization that things had to change. While Birmingham city officials closed parks and swimming pools, attacked civil rights marchers with fire hoses and police dogs and created a culture of hate leading to the bombing of a black church that killed four little girls, Atlanta, “The City too busy to hate,” left Birmingham in the dust. This dark period was the backdrop for Isom’s account of his formative years. In Isom’s fifty-one short chapters containing memories and short reflections, we learn how he first accepts and even defends the view of his father, a Greyhound bus driver, that “whites in front, colored in the back” was the way things were supposed to be and that he was a follower of Asa “Ace” Carter, who warned that race mixing was a part of the Communist conspiracy, along with fluoridated water. And how in the course of delivering newspapers, his encounters with Helen and Vern Millers, a white couple from the upper Midwest who had recently moved to Birmingham, and Mattie and Sam Broadnax who were black and long-term residents of their segregated neighborhood, caused him to question the culture and traditions of the South that treated African-Americans as second class citizens. Almost every chapter has a moral, but sometimes you have to find it, especially early on when Isom’s frame of reference was such that it would be much later in life that, looking back, he was able to discern what it was. There is no epiphany or moment of enlightenment, but rather a slow and uneven process of discovery. Isom leaves the Empire Building without the offer of a summer job from Berkowitz, but he goes on to finish law school and have a successful career while contributing more to the renaissance of Birmingham than he gives himself credit for. Meanwhile, his father retires from Greyhound and takes on both a new line of work and a different perspective on race relations. And as fate would have it, their lives reconnect in the Empire Building. How that came to be, you will need to read for yourself. This is a well-written and evocative book. 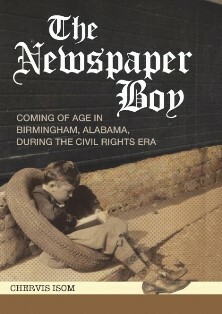 Both as the quintessentially American story of a kid from a blue collar family making it in life through hard work and determination, and as an important contribution to the history of Birmingham The Newspaper Boy delivers. Jim Buford is a management consultant whose published creative work includes essays, short stories, and social history. He presently serves on the Alabama Writers’ Forum Board of Directors.